On Wednesday I noticed oil being ejected around the front of the engine on the frames. 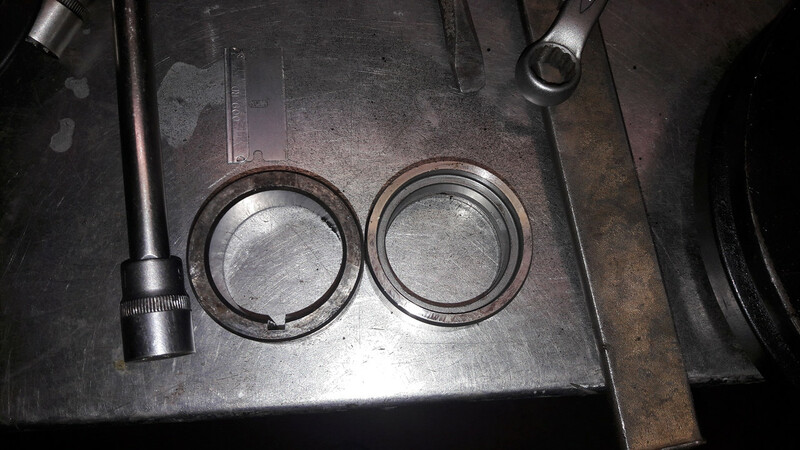 Further inspection revealed that it appeared to becoming from the front pulley crank oil seal. The bits arrived today so 2 hours after I get home from work I get to the seal. Pulley off, cone off, sump down. Need to raise the motor a bit to get it off, I will do that tomorrow. These are the seal bits I have been supplied with. 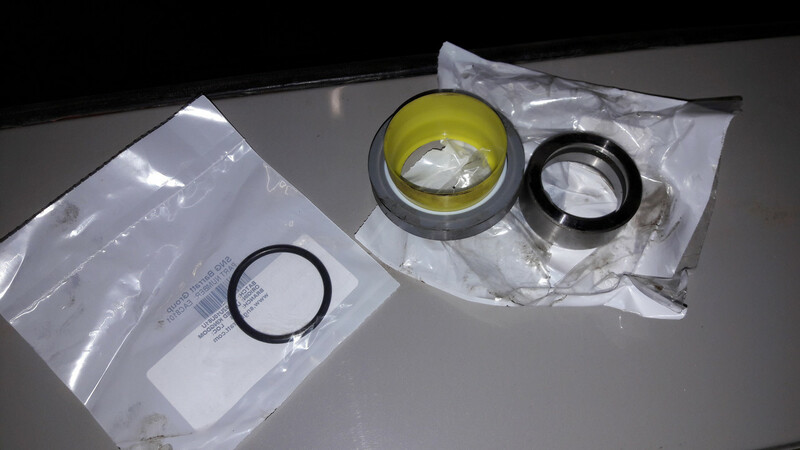 I also have the sump gasket and rear sump gashet seal and some lovely black Wynns black gasket compound. Not quite sure how to get the old distance piece out to allow the black seal to be removed. Not sure which way the distance piece goes. It has a distinct champher on one end. I assume the yellow collar is to protect the seal sliding over the distance piece. ? Not sure about the rubber O ring either. Any assistance from those that know greatly appreciated. Yes, its the new motor. There was some messing around with timing covers and water pumps, I suspect that is the culprit. never mind, old cars are old cars! Looks like I have the new Teflon seal kit to fit then. I assume the champher on the distance piece is fitted towards the o ring then. Last edited by politeperson on Fri May 12, 2017 8:33 pm, edited 2 times in total. Make sure you put the seal on the right way around. They can be mounted backward on the yellow plastic installation piece out of the package. You will need to remove the oil slinger. I assume you mean the new grey seal is fitted in the same direction as the old black one that I remove in the photo. 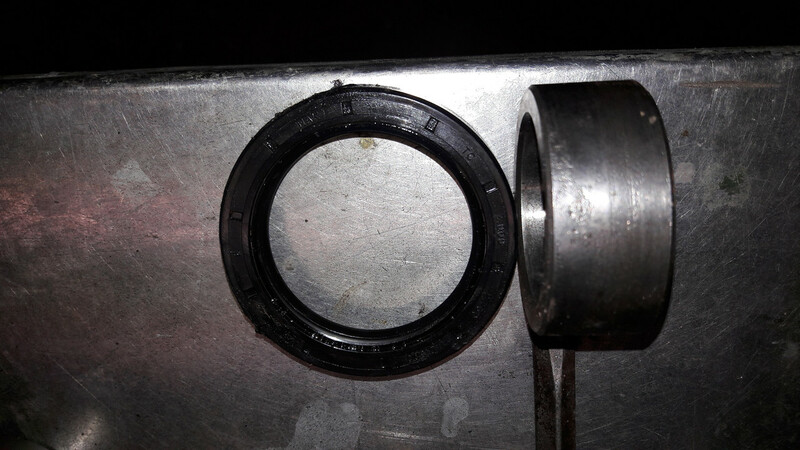 As I discussed in this thread viewtopic.php?f=3&t=9746 it is highly probable that the outer rubber ring of your Teflon seal is too large for the grooves in the timing cover and oil pan. It will not seek center after assembly as mentioned in the Georgia paper...and it will leak. Resizing is discussed in the thread. OK, Thanks chaps once again. From what I understand so far, this simple problem of sealing an engine is relatively complicated. I thought this problem of clearances and seals had been put to bed 100 years ago. 1) The new seal, supplied by a respected large Jag parts Specialist might or might not fit. If it doesn't fit, it will take 1 day of messing around to get it to centre. (Really?). 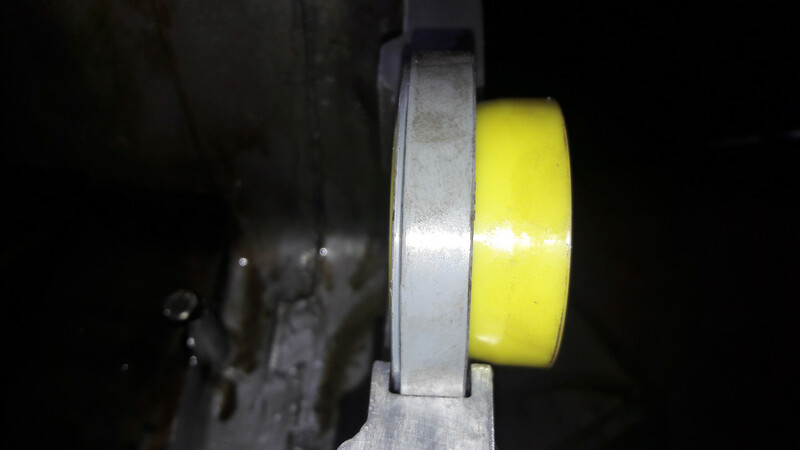 2)The yellow fitting piece on the seal can be discarded when fitting, as per in Dicks instructions. 3)The new seal goes into position, the sump then goes back on helping the new seal centre. Then the new distance piece pops in, I assume with the chamferd end pointing in, to stretch the seal tip without damaging it. 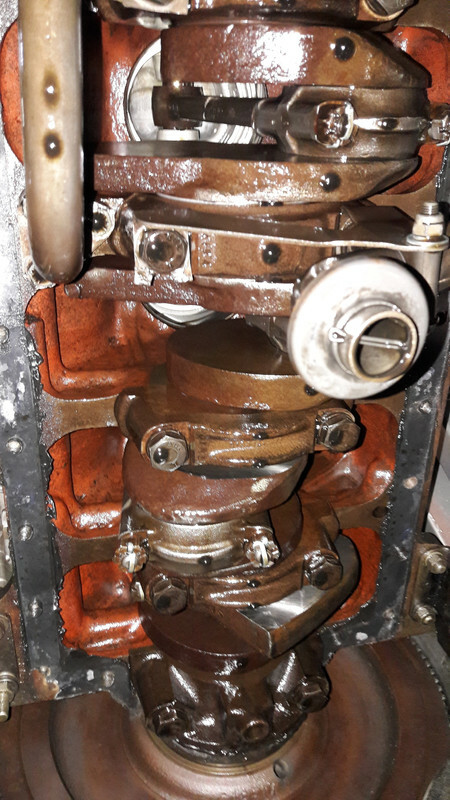 4) Its much easier on a later Series 2 timing cover than an earlier timing cover as the later groove allows the seal to be removed with the crank in situ, the earlier requires the timing case to be removed as well. So, I think I just have to get on with it and see if it leaks! Yes, Really. Here are some photos of what Glen Jarbo documented on Jag- Lovers years ago. My engine was on an engine stand. 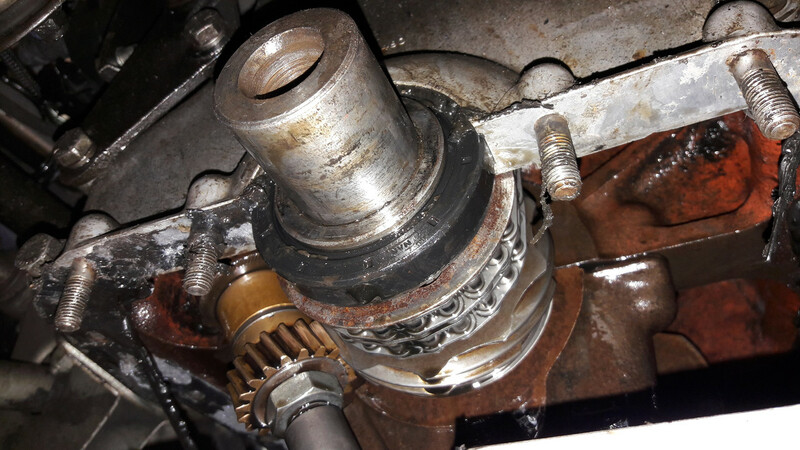 After reading Glen's related article and speaking with him (he lives ten minutes from me) I positioned the unmodified seal and then installed and torqued the pan with the pan gasket installed. Same gap as Glen had documented...and it was clearly not going to self center from the pressure. Another local friend tried this installation with two of these unmodified seals and both distorted and leaked. He gave up and installed a standard Jaguar lip seal...no leaks. If you'd like to speak with Glen and Mike I can put you in contact. There are many old posts on J-L about leaks resulting from ill-fitting Teflon seals. It's clear the problem has been the fit in the groove, which results in poor fit of the sealing surface on the crank. Might be a function of the groove size. Perhaps the respected Specialist who supplied my part changed the specs on the seal they were supplying three years ago, but it looks like the same kit. I'm sure you are much faster than I with these things...I admit to being slow and deliberate...but I do have a front seal that does not leak. Flamin eck, well thanks Eric. This is the new seal (2.750) positioned in the groove. To remove the sump I had to raise the engine and box a bit. 10mm or thereabouts I would estimate. It came out ok, leaving me a nice view of my crankshaft. At least the flywheel looks dry. Fixing a leak there would be a right faff. Last edited by politeperson on Sat May 06, 2017 7:18 pm, edited 2 times in total. Well I did it. I think. It was a victory snatched from the jaws of defeat in the end though. If I was doing the same job on an S1 or S1.5 I might not have finished it by now. The timing cover would probably of had to come off extending the drama by a few more hours. The cause of the leak was obvious once the distance piece was removed. It was old rusted and pitted. Unfortunately the new replacement came with no keyway! So it wouldn't fit! . Both below. Then I remembered I had the original engine lying around. Luckily the old distance piece was very good nice smooth chrome finish. So I cleaned all the old gaskets off, glued the rear seal in place on the sump holding it with spring clips, glued the sump gaskets, turned the engine so the woodruff keys were pointing downwards and the slid the new seal (without the yellow stretcher) into position. 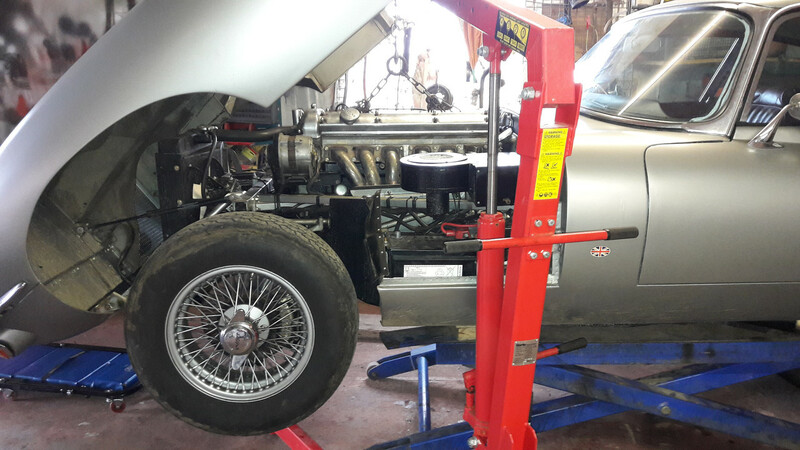 Then I jacked up the engine and box again, carefully refitted the sump, looked at the new seal (looked central to me), tapped in the new (old) distance piece, reassembled everything, struck her up. 10 minutes no oil leak, not a drop. Need to do a proper run but so far so good. Old Seal and pitted distance piece. So, did you install the oil slinger with the original length distance piece? I left the oil slinger in place and fitted on old original length distance piece, that was in good condition. Guess Ill find out now. How do you tell the difference between a lip seal and a Teflon seal? To be honest, I just ordered a seal and didn't think what it might be made of. The one that came out was black, the replacement was grey! Black seal comes with gasket set. Teflon is extra and used to only come with collar and o-ring as a 3-piece kit. 'Centred' refers to radially on the distance piecd, not axially in the groove. One photo seemed to suggest the latter? It will be interesting to see if it lasts with the slinger fitted. What matters is where the lip portion of the seal sits relative to the crank when installed with the oil pan cover torqued. That can't be eyeballed with the engine installed. For piece of mind, I'd get a few straight on photos if possible. It looked spot on when viewed from the end of the crank. I have done 90 miles today, not a drop yet! I haven't a clue what the yellow tube is about. Maybe it assists fitting in some applications. It wasn't much use to me with the Jag, so I just pulled it off. The loose front wheels turned out to be one loose wheel bearing and one loose spinner!. Now fixed.